We know the feeling of wanting to overhaul your closet for spring, but what about your hair? It needs a fresh new look, too, right? The weather is warmer, more humid and you’re busy. REALLY busy. But “chip clips” are so 2000 and a basic pony, well, that’s everyone’s look. Let’s find some better alternatives, shall we? 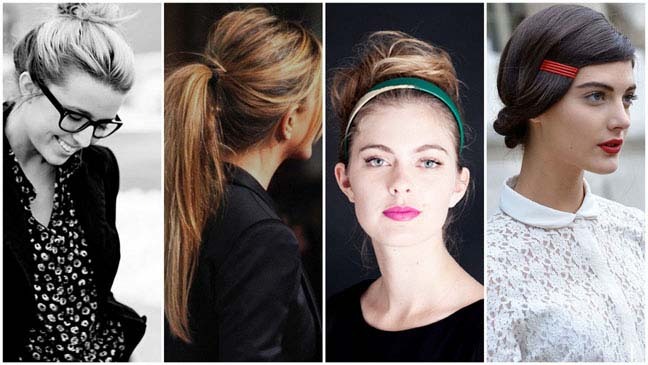 The TopKnot – fashion’s go-to hairstyle right now. Best done when your hair is not perfectly clean (score!) and a little messy is better than perfect (score!). Your hair is off your neck, you don’t look like you’ve tried too hard and, oh, look, your ears are front and center for that fabulous new pair of earrings you just got. WIN. The Edgy Ponytail – Jennifer Anniston set the bar for this (also for first husbands). A little height in the crown, not too perfect and some face-framing layers add casual elegance. Want some polish? Wrap a piece of hair around the ponytail holder for a more finished look. The Sophisticated Headband – Goes perfectly with The TopKnot. Extremely handy for that “Growing Out My Bangs” stage we all hate. Pick a modern headband like this Gold Rush Headband from ban.do to look more chic than “grabbed it from my daughter’s room”. Bonus: You get a great pop of color to offset those fresh hot pink lips. Barrette Boom – The simplest accessories grouped together always look chic. Stack a few colored drugstore barrettes next to each other for a simple and interesting hair accent. Watch your tween steal the look – then smile smugly. Pam is the creator and editor of outsidevoice ™ which she founded in 2005. She is an old soul in high heels, accessories whore and mom in search of the perfect piece of cheesecake. (Not always in that order.) She believes every personal collection should include the aspirational, the attainable, humor, and charm. That goes for her people collection as well. Because information is her gateway drug she is also deeply involved in the mom-blogging and social media communities where you can find her interacting globally on topics like style, beauty, food, philanthropy, her latest retail wish list and the ridiculousness that happens when you live with a four-year old and nine-year-old. Want to join that Twitter cocktail party? Follow Pam at @outsidevoice. You can find Pam on Tumblr under her evil twin's handle AccessoryWhore ® and creating inspiration boards on Pinterest as well. She is a little obsessed with the imagery, but has no plans to seek help any time soon.